A mobile phone that gives its owner a health check is being developed by experts at Leeds University. The device can be used to check vital signs, glucose and blood oxygen levels. The results are then sent straight to a remote computer where a nurse or doctor can analyse them and contact the patient if anything is wrong. The university said the phone would mean patients at risk could avoid making frequent trips to their GP for routine checks. Research project leader Dr Alison Marshall said: "By 2014, the number of people over 65 living in the UK will exceed those under 16. "We need to find technology solutions that provide a greater level of care for patients in new ways. "A mobile phone certainly shouldn't be seen as a replacement for doctors, but it will help patients take control of their own health in conditions such as heart disease, diabetes, lung cancer and obesity." 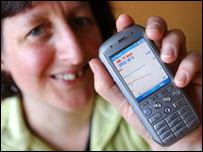 The phone 'talks' to small wireless devices, such as a blood pressure monitor which is strapped to the wrist. In a critical situation, the phone would automatically alert health professionals with a phone call. A prototype will be tested on research volunteers next month to see if any improvements need to be made before a bigger trial next year.